One of Pi-Mu’s own, Frater Chris Millis wrote the screenplay for Small Apartments which will be released at theaters on February 8, 2013. 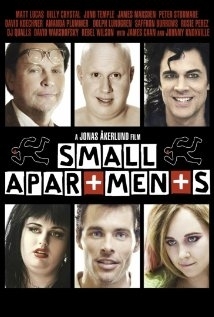 Small Apartments is an American comedy film directed by Jonas Åkerlund. It tells the story of Franklin Franklin, played by Matt Lucas, who by mistake kills his landlord, played by Peter Stormare. The cast co-stars Dolph Lundgren, Johnny Knoxville, James Caan, Billy Crystal, Juno Temple, Rebel Wilson, Saffron Burrows and Amanda Plummer. The film premiered at the South by Southwest Film Festival on March 10, 2012. It will be released in the United States on February 8, 2013 in select theaters (via Tugg.com) and February 19th on DVD, Blu-ray & On Demand. This entry was posted in Teke Chatter. Bookmark the permalink.